A new collection of Adventure Time shorts has emerged, each tale separate from the others in subject matter, but all still in possession of the heart of the original TV show: friendship, fun, and crazy adventures. These four shorts are good, but two of them are true Adventure Time Comics gold, struck and shaped by Derek Laufman and Jeffrey Brown. The beautiful cover art by Cole Closser for Adventure Time Comics Issue #17, image from kaBOOM! The first thing to note about this collection is the order in which the stories are presented. The opening story “Happy Birthday in Ooo!” feels trite, and its rhyming scheme could use some help. The writing is not as strong as it is in the other comics in this collection. It may have been better to open Adventure Time Comics #17 with “Escape Room” by Derek Laufman. Closing it with “Finn Sandwich” was a wise idea, for it leaves the reader thinking about the land of Ooo as a whole community of creatures. “Marceline’s Lumpy Space Party” is filled with so many teeth it’s hard not to call it a toothy space party instead. “Happy Birthday in Ooo!” is a bright and sweet short comic. All of this being said, it’s a joyful conglomeration of considerate art and color that takes us away to the land of Ooo for new stories. Questionable rhyming and cute art, this story is perhaps better suited for a children’s book. It is adorable nonetheless, and cheerful and friendly in the way that Adventure Time is. But it feels like it could be more. 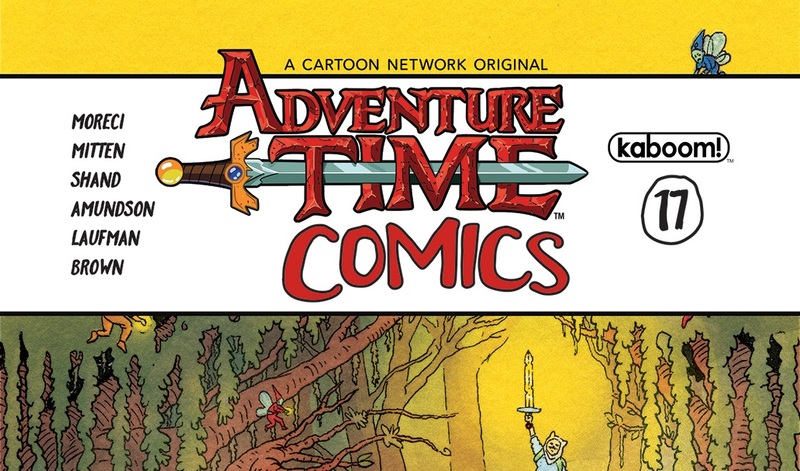 The whole comic is narrated by Jake, who is attempting to make words rhyme as he and Finn travel around the land of Ooo. It reads like a painful poem. The end seems like a non-sequitur compared to the rest of the comic, but it is more interesting than the beginning of the short. I wish that Morici and Mitten had focused on that Adventure Time-level absurdity they clearly know how to handle and written a comic with that strong sense of weirdness and affection that resonates between Finn and Jake. Instead they wrote a beautifully drawn and colored children’s journey. This is still fitting, as many Adventure Time readers are of a young age, though I can’t help but shake the feeling that this could have been more. This story drew me in immediately, and not just because it involved Marceline the Vampire Queen. It’s great to see Marceline and Lumpy Space Princess (LSP) interact and have their own story without main characters Finn and Jake. Marceline’s performance is great, and it’s certainly believable that selfish, lumpy space kids would try to keep her there to force her to play her music eternally in lumpy space. Shand’s dialogue is so consistent one can almost hear the voices of the characters while reading the story. Amundson’s art includes a great number of tributes to teeth in particular, including characters that have many teeth and wear t-shirts with teeth on them. It’s truly remarkable, the number of teeth. I tried to count them, but once I went over 200, and there were two whole pages of giant teeth left, I gave up. It is worth noting that this comic is a dark romp in lumpy space, and the artistic portrayal of Marceline by Amundson is truly monstrous in the best way. This one is a great representation of everything great in the Adventure Time animated series. There’s adventure, friendship, and just enough heart. It’s cool to see each character be true to themselves in this short comic featuring Princess Bubblegum, Finn, and Jake. This comic is fun and meta enough to know it’s making fun of Adventure Time while keeping the short comic lighthearted. 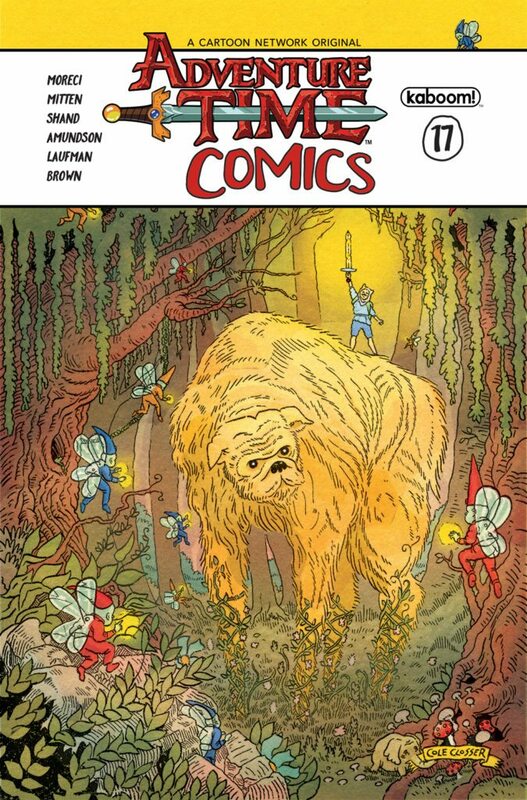 I would have opened the collection with this comic because it is more true to Adventure Time‘s spirit. This short really shows off the different strengths of each character as they attempt to navigate the escape room. As you would imagine, Princess Bubblegum is logical, Finn has heart, and Jake performs a magical stunt. This short is delightful for the eyes. It is a candy-colored journey through the land of Ooo in a comic nearly devoid of dialogue. Despite this lack of chatter, the simple artwork draws the reader into the quick, natural flow of the story from panel to panel. Brown does an excellent job keeping the different parts of Ooo separate yet connected visually throughout the story, using colors to transition from one place to another as the story moves through the comic. Each character that Finn and Jake meet on their journey has a distinct palette, landscape, and personality. “Finn Sandwich” not only makes me want a sandwich, it makes me want to read this short again just to look at the deliberate, artful execution of the story. Adventure Time Comics #17 is certainly worth a read, firstly for an appreciation of the various art styles and how beautifully they represent the land of Ooo. Secondly, it’s worth diving into because of the enjoyable continuation of the lives of our favorite Adventure Time characters. It’s also worth mentioning Cole Closser’s enchanting cover illustration which calls fairy tales to mind and adds to the magic of this comic book.